And he slowed down. Imagine if he ran right through? Take my 100 meter to 200 meter conversion equation of doubled and add or subtract +/- 0.2 seconds = 19.38 (+/- 0.2). Will he win 3 Golds with Jamaica winning the 4x100m relay? How about 4 Olympic Gold medals? Add him to the 4x400m relay pool, I say! The video of this 9.69 Olympic World Record is posted YouTube below. UPDATE: YouTube and NBC Olympics are cracking down on illegal copies of this broadcast. 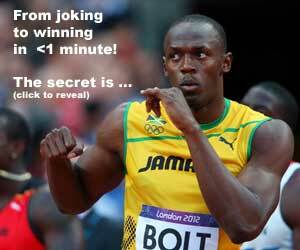 Therefore, check back on this site in a few hours for the latest Usain Bolt 100m 9.69 Olympic World Record Video. BEIJING – Jamaican Usain Bolt won gold in the men’s 100m dash Saturday night, setting the world and Olympic records at 9.69. Richard THOMPSON of Trinidad and Tobago finished second in 9.89; American Walter Dix earned the bronze with a 9.91. Bolt got a good start and pulled away early. With 20m to go, he began to look around and raise his arms in celebration. As he crossed the finish line, he pounded his chest. His 9.69 could have been that much faster. A self-titled 200m specialist, Bolt only recently started running the 100m. He begged his coach to try it and worked several months before this season on his start. When he originally took the world record in May with a 9.72 in New York, it was just his fifth time racing the event. Former world record-holder Asafa Powell of Jamaica was fifth. The man missing from everyone’s dream final was Tyson Gay of the United States, who finished fifth in his semifinal and did not qualify. For Gay, the Olympics was his first competition since falling injured in a 200m race at U.S. Trials. He said his leg was not injured in Beijing, but his fitness may not have been peaking. Bolt is the first Jamaican to win gold in the 100m. In previous Games, the country has captured silver three times: Herb McKenley in 1952, Lennox Miller in 1976 and Donald Quarrie in 1976.